In a series of East Coast debates and public forums from Sept. 15-26, Jeff Mackler, Socialist Action’s 2016 presidential candidate, spoke to enthusiastic audiences about the relevance of revolutionary socialist politics today. Mackler’s tour included public meetings in New York City, Albany, Boston, Providence, Hartford/New Britain, and Philadelphia. In the course of his 12-day tour, close to a dozen social and political activists expressed interest in joining Socialist Action, opening up new opportunities for socialist education, party-building activity, and participation in rising social movements in all of the cities he visited. This month, Socialist Action’s vice presidential candidate, Karen Schraufnagel, will begin a speaking tour of several Upper Midwestern cities, including Chicago, Madison, Duluth-Superior, and Waukeesha, Wis. See this website’s EVENTS calendar for more information. Jeff Mackler was joined in a Socialist Action-sponsored forum in New York City by former political prisoner and people’s attorney Lynne Stewart and New Abolitionist leader Ralph Poynter, who have endorsed Mackler’s presidential campaign. In Albany, Mackler was joined in a debate format entitled, “The 2016 Elections: Humanity’s Future in Troubled Times.” Speakers included Joe Seeman, a Hillary Clinton supporter and volunteer organizer with the Working Families Party, Citizen Action of New York, MoveOn.org, and the Bernie Sanders network of the Capital Region. Also speaking were Peter LaVenia, co-chair of the New York State Green Party, who supported Jill Stein. The Albany Public Library debate was initiated by activists in the Bethlehem Neighbors for Peace and chaired by Joe Lombardo, national co-coordinator of the United National Antiwar Coalition (UNAC). He counterposed the corporate-promoted illusion that significant social gains can be achieved by the election of one or another capitalist or pro-capitalist party or candidate to the socialist perspective that working-class victories have always been the product of massive, independent working-class and allied mobilizations independent of and against the policies of all capitalist parties. “History repeatedly teaches us that only capitalism’s victims, the vast majority of working people, organized to fight for their own interests through their own organizations, can change the course of history. Without exception, Mackler’s Democratic Party and Green Party debate opponents cited the reactionary, racist, misogynist, Islamophobic views of Donald Trump to urge support for Hillary Clinton or Jill Stein. “Lesser evil” arguments were in full bloom during virtually every debate as speakers minimized or offered soft criticisms of Clinton’s record of warmongering and racism while insisting that the “fascist” Trump had to be stopped. Jill Stein supporters, on the other hand, pointed to the need to organize to elect Green Party candidates at the local level to build a mass electoral base aimed at reforming capitalism, usually along the lines of the pro-capitalist social democratic parties in Europe. Stein supporters called for a 50 percent cut in military spending as well as free college tuition and health care (all achievable goals, they argued) in the framework of a reformed, kinder, gentler capitalism—one whose banking and fundamental corporate structures could be altered without challenging the private profit basis of the system itself. Green Party debaters most often focused on their goal of achieving the five percent electoral threshold necessary to receive the $10 million in government funding for future campaigns. Mackler’s critique of his Green Party opponents centered on their view that “independent political action” essentially excluded the fundamental proposition that any effective challenge to capitalism required the organization and re-organization of the working class through their own revitalized institutions—democratic, fighting and qualitatively expanded trade unions—that are funded by and controlled by workers themselves. Without this independent working-class perspective—coupled with its expression in the political arena with a fighting Labor Party, controlled by working people—Mackler argued, the Green Party perspective amounted to organizing a vague multi-class electoral alliance that can only be limited to reforming a system that cannot be reformed. “The simple fact that Jill Stein urged a vote for Democrat Bernie Sanders in the California primary elections and elsewhere, or that Greens in their vast majority argued that Sanders, with a 98 percent Democratic Party voting record, should become the Green Party candidate for president,” said Mackler, “tells us that Green Party politics, historically an “inside/outside” reformist strategy, are fundamentally flawed. The Boston debate, entitled, “Elections 2016: Humanity’s Future in a Troubled World: What About War, Climate, and Social Justice?” included Jill Stein supporter Danny Factor, the Green Party candidate for State Assembly; and Hillary Clinton supporter and 350.org member Rosalie Anders, also a board member of Massachusetts Peace Action (speaking for herself rather than for the organization). Mackler was also joined on the debate panel by Democratic Socialists of America National Political Committee member Jared Abbot, who was listed as advocating, “Vote Strategically to Defeat Trump—Greens or Democrats.” Abbot argued for DSA’s perspective of voting Green in “safe states” and for Clinton elsewhere. The debate was sponsored by United for Justice with Peace and chaired by Marilyn Levin, a leader of UJP and the co-national coordinator of UNAC. Socialist Action in Philadelphia co-sponsored Mackler’s forum in that city with the on-line journal Left Voice. Mackler was accompanied at the podium by Left Voice editor Juan Cruz Ferre, who supports Mackler’s campaign. Ferre recounted the experience of the Socialist Workers Party (PTS) of Argentina in winning 1.5 million votes in the last presidential election when three revolutionary socialist parties joined to form the Workers Left Front (FIT). The FIT won several seats in the Argentine parliament while participating in several major working-class mobilizations that challenged the government’s austerity offensive. The Providence forum, sponsored by Rhode Island Socialist Action, was held at the Direct Action for Racial Equality headquarters and included welcoming remarks by the DARE director as well as from LGBTQI activist, Josh Kirby. Mackler’s forum in New Britain, Conn., was sponsored by the campus Central Connecticut State University (CCSU) Youth for Socialist Action, a youth group in solidarity with Socialist Action. It was attended by some 35 young people, mostly students. Mackler noted that this audience was by far the most advanced in rejecting “lesser-evil” politics and in solidarity with fundamental socialist ideas. To date 31 CCTU students have joined the YSA chapter, plus several others who signed up at Mackler’s campus forum. (Photo) Participants in the Socialist Action forum in New York City: (From left) Ralph Poynter, Jeff Mackler, Lynne Stewart, and chairperson Marty Goodman. 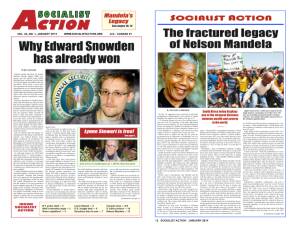 Vote Socialist Action in 2016! Jeff Mackler for U.S. President!